"In a globalized world, employers are confronted by a bewildering variety of professional qualifications, some valid, some less weighty and some spurious and fraudulent. This excellent compilation enables the reader to touch base with such organizations and explore their true credentials through access to their whereabouts including Web sites. It is additionally pleasing that updates will be provided via the publisher's own Web site." "I've often wondered what the 'alphabet soup' after some colleagues' names means and how impressed I really should be. Now I can find out!...This directory will be a valuable reference guide for human resource professionals and anyone else who wants to know what those letters mean and how seriously to take them." 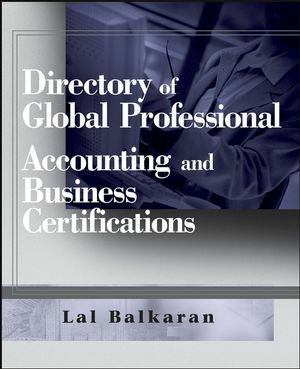 "The Directory of Global Professional Accounting and Business Certifications by Lal Balkaran is an indispensable reference source for anyone involved in the international accounting, auditing, and business professions. It is global, comprehensive, accurate, and easy to use. It is like having a personal contact book to all the world's professional organizations." Organized as a directory for easy reference of accounting and business designations, designatory letters, and contact information of all disciplines, Directory of Global Professional Accounting and Business Certifications contains over 960 bodies administering well in excess of 2000 designations and designatory letters in 145 countries. This handy, yet comprehensive, directory also provides an index with a country-by-country listing of the professional designations that exist there. Lal Balkaran is self-taught and is a Certified Internal Auditor (CIA), Certified General Accountant (CGA), Fellow of the Chartered Institute of Management Accountants of the UK (FCMA), and Fellow of the Institute of Chartered Secretaries and Administrators in Canada (FCIS). He also holds an MBA from Heriot-Watt University of Edinburgh, Scotland. Mr. Balkaran has had over 25 years of senior finance and varied internal auditing experience obtained in a wide range of industries in the Caribbean and North America. He has had articles published in several international journals including four in the Institute of Internal Auditor’s (IIA) own prestigious Internal Auditor. On top of this, he has authored the following six reference books on international professional accounting and business certification programs: A Practical Guide to Auditing and Related Terms [World’s first dictionary of auditing]; Accountants & Related Professionals: Reciprocal Memberships & Peer Acceptance; Handbook of Global Professional Accounting Programs; Handbook of Global Professional Business Programs; Managerial Control Techniques and; Professional Accounting & Business Programs: Effective Study and Examination Techniques. He also wrote five reference books on his native Guyana. Mr. Balkaran taught courses in Internal Auditing, Management Accounting, and Quantitative Techniques, and was an external examiner to two Commonwealth universities. He is a past President of the Toronto Chapter of the IIA and was recently made an Honorary Member of the chapter. Mr. Balkaran has also done several seminars in North America and the Caribbean on internal auditing related topics. He is a member of the IIA’s Global Board of Research and Education Advisors, the Internal Auditor Editorial Advisory Board, and the Internal Audit Advisory Committee of the Treasury Board of Canada. Mr. Balkaran is also the founder of IIA-Guyana. He currently works as a Senior Manager in the Advisory Practice of KPMG in Toronto. United Kingdom and Northern Ireland. Index by Country and Administering Body.